Add the flour and the salt to the bowl of an electric mixer, and mix on first speed for a minute. Dissolve the yeast in lukewarm water. Combine the yeast with the flour/salt and beat on first speed for 2 minutes. Scrape the bottom and the sides of the bowl, and beat on second speed for 6 minutes. Cover the bowl and let it sit on a warm place for 1 hour. Heat a griddle to 390F (200 C). Dissolve the bicarbonate in the cold water and mix this solution to the batter. Use right away, pouring a small amount of batter in well greased crumpet rings. Cook for about 8 minutes on the first side, until bubbles form and the batter seems almost dry on top. Remove the rings – carefully, they are hot! – and flip the crumpets, cooking for no more than 2 minutes on the second side. Cool on a rack, and enjoy! Make the preferment and let it sit at room temperature for 12 to 24 hours. Comments: Both recipes are pretty straightforward, with little hands-on time required. The traditional method allows you to have crumpets ready in about 1.5 hours, versus a little over 4 hours for the sourdough variation (not counting the pre-ferment prepared the day before). The next sets of photos give you an idea of how different the batters looked right before cooking, and how the authentic version gave a more hole-y texture in the crumpets already during cooking. 1. Do not fill the rings more than halfway, because if you do, the holes will close when you flip the crumpets. It is tempting to add more batter, but resist the urge to do so. Also, it will be harder to cook them through if they are too thick. 2. Do not cook them on a griddle that is too hot, or you will have a hard crust at the bottom and the crumpets won’t cook uniformly. Better to keep a lower temperature and cook longer. 4. Grease the rings again for each batch of crumpets, so that they are easily removed. Crumpets are fragile, if they stick to the ring their shape can be compromised. 5. The rings are hot, and stay hot for a while once you remove them from the griddle. It is easy to forget about it as the second batch gets going (sigh). they are best still warm, but we’ve enjoyed them for several days, cut in half and toasted… delicious! hee-hee, love the title! What a great idea, making your own crumpets, it never occurred to me – that’s so neat. We love the spongy, airy, texture of crumpets and their so yummy with summer berries… Thanks Sally. Ha, I have that same yellow plate! More importantly, can’t wait to try these! We had them in Australia, but can’t find good ones here. They are indeed a ton of fun – it’s amazing, though, how a very simple thing still needs practice to do a good job. A little more heat, a little more batter, and you don’t hit the perfect crumpet. I have to commend you for making not one but two kinds of crumpets! Well, Karen.. not on the same day, but following weekends. See? I am lazy! 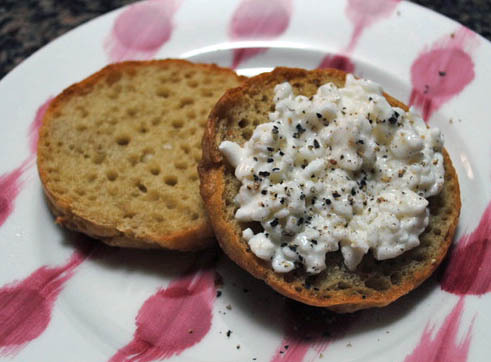 I’ve never attempted crumpets, but I did once try to make sourdough English muffins. It was a disaster. Maybe I need to try crumpets instead! but crumpets are more forgiving, I think – my main disaster has been 100% rye bread. I haven’t recovered from that event, a dark, very dark spot in my culinary adventures. Yum, I love this tale! Good kind of tale… you get to eat it at the end! I’m sooo impressed! Thanks for adding in the tips, very helpful for those that have never attempted this before!! I loooove crumpets but I have never made them myself. I’m off to buy rings tomorrow! I’ve never had a crumpet before. This looks so good! I’ll try the traditional version…if you say it’s better than the one with sourdough it must be good! I used to love crumpets but I ate them every morning during one of my chemo sessions and now I can’t face them anymore. There is a really easy English muffin recipe on my blog if you ever want to make them. You make the dough and leave it to rise over night. Then it only takes a few minutes to cook them for breakfast.